I first heard about the Maybelline 'Baby Lips' years ago, and was so disappointed when I found out they weren't available in the UK. Now they've finally hit our shores and I couldn't resist picking up 2 from the 6 available shades! There are 4 tinted shades (Cherry Me, Peach Kiss, Pink Punch and Mint Fresh) and 2 colourless balms (Hydrate & Intense Care). I love the shade names and, of course, the packaging is so bright and colourful, one of the reasons they've become so popular. 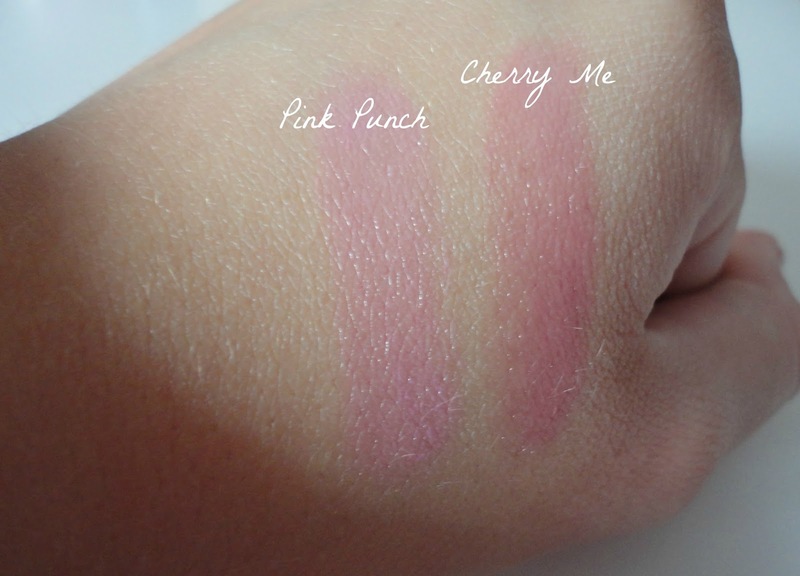 The shades I got were 'Cherry Me' (left) and 'Pink Punch' (right). As you can imagine, Cherry Me gives a red tint and Pink Punch gives a pink one. I've included swatches above, so as you can see, they give a lovely sheer wash of colour without being anything bold or dramatic. This makes them a lovely daytime balm, and I'll definitely be throwing one into my college bag! As they are essentially a tinted lip balm, they are really moisturising and weren't too thick or sticky, so I'm really happy with that side of it. The only other thing I could compare them to is the Vaseline Rosy Lips in the stick which is a similar colour to Cherry Me. However, the price of these Baby Lips is so reasonable (£2.99 but I got mine '2 for £5' at Tesco) that I can guarantee it won't be long till I have the whole range! It seems everyone in the blogosphere is raving about these! Looks like I'm going to have buy some!